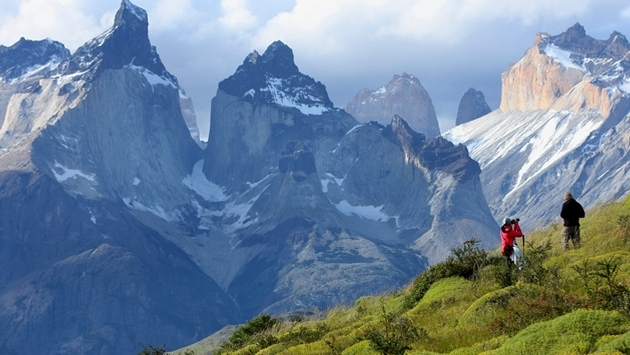 Chile extends only 271 miles between its most distant eastern and western points, but the long blade of a country runs 2,670 miles from north to south, more than enough room for a stunning array of impressive natural and man-made landscapes. The country’s panoramic regions range from isolated and dream-like fjords, inlets, canals, peninsulas, and islands of Patagonia to Valparaiso’s steep hillsides, colorful, historic houses and 100 year-old finniculars. Chile’s man-made attractions start at the capital city of Santiago, which offers a full menu of options for vacationers in search of South America’s sophisticated side. Santiago is a global metropolis of the first rank, with long, tree-lined boulevards, large public parks, historic colonial buildings, a skyscraper-infused central business district, trendy restaurants and several bohemian neighborhoods and fine art museums. The modern transportation system includes South America’s largest subway system. Valparaiso’s finniculars: The historic coastal city offers a visual feast hinted at by its nicknames “San Francisco of the South” and “Jewel of the Pacific. Valparaiso is a UNESCO World Heritage city built upon a network of 42 steep hills dotted with brightly colored buildings winding upward from the shore. 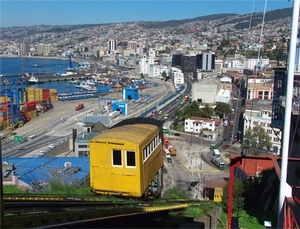 PHOTO: View of central Valparaíso, Chile, from the top of the Artillería funicular. Photo courtesy of Wikipedia. The city’s fortunes boomed in the years prior to the Panama Canal’s opening, when Santiago became a desired way station for ships rounding South America through the Strait of Magellan. Hillside funiculars (“ascensores”) were built in the 1880s to improve local transportation for the city’s students, artists and maritime workers. Today’s Valparaiso is a strolling town of the highest quality, with numerous restored Victorian-era buildings, trendy restaurants and small hotels overlooking the deep blue waters of the Pacific Ocean. Valparaiso is home to Latin America's oldest stock exchange and Chile's first public library. El Mercurio de Valparaiso is the oldest Spanish-language newspaper in publication. At times the city has had as many as 26 working funiculars. 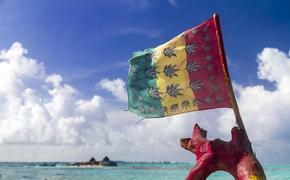 There are now only eight still in use and they are considered among the world’s most endangered historic structures. While several of the funiculars are resorted, their continued accessibility is not certain. Valparaiso was also the scene of an April 12 fire that killed at least 16 people and destroyed an estimated 500 buildings. The city's historic district and its late 19th century architecture were not impacted by the blaze. However other parts of the city suffered heavily from the fire. There is no better time to provide this much-needed visits and tourism revenue to this still-impressive city. Sublime Santiago: Santiago’s numerous distinctive neighborhoods offer a variety of intriguing attractions; the city is very pedestrian friendly and visitors will feel quite comfortable on biking or walking tours. The Barrio de Lastarria district features antique manor homes and baroque balconies intertwined with smart retail shops and bookstores. There are also racy lingerie shops, burlesque cabarets and artistic murals adorning public walls linked by quaint cobblestone streets. Barrio Lastarria is also home to Cerro Santa Lucia, a small hill in the center of Santiago formed by the remnant of a volcano. The hill offers a panoramic view of the city and is highlighted by Castillo Hidalgo, a fort built in 1820. Cerro Santa Lucia’s park offers ornate plazas, facades, fountains, lookouts and stairways. The hill’s curiosities include a six-foot-high stone monument inscribed with a paragraph extracted from a letter Spanish conquistador Pedro de Valdivia sent to Emperor Carlos V describing the new land. No culturally focused trip to Santiago would be complete with a visit to “La Chascona,” the home of the Nobel Prize-winning Chilean poet, diplomat and politician Pablo Neruda, located in Barrio Bellevista, a bohemian neighborhood at the foot of San Cristobal Hill. Neruda’s 1924 masterpiece, Twenty Love Poems and a Song of Despair, a ground-breaking collection of love poems that was controversial for its eroticism, predated a long diplomatic career highlighted by a period as a close aide to socialist President Salvador Allende in the 1950s. Today, Neruda’s home is a virtual museum with priceless paintings, drawings art and sculpture, along with his Nobel Prize medals. Daily tours are available. Wine time: Chile’s eternal rivalry with Argentina has led residents of the former to estimate they produce 10 times as much wine as their beloved neighbors. Indeed, Chile is the world’s fifth-largest exporter of wine and its eighth-largest producer according to Tourism Ministry estimates. PHOTO: The Colchagua Valley, Chile's premier wine-making region. Photo by José Porras. The Valley’s climate is ideal for the production of Carmenere, the red wine considered Chile’s flagship varietal. In all, there are about 180 wineries in Chile; it’s even possible to take a subway ride to a winery. Beyond the Colchagua Valley, emerging Chilean wine regions including San Antonio, home to the family owed Vina Casa Marín winery. Casa Marin is located the closest to the Pacific Ocean of all of Chile’s vineyards (only three miles from the coast), and the terrain profoundly influences the wines’ character, says Maria Luz Marín, the winery’s owner and winemaker. Casa Marin is unusual in Chile due to its focus on white wine. Indeed, the winery today is best known for its outstanding Sauvignon Blanc, an international award winner. Reciprocity: Beginning this month, Chilean citizens will no longer be required to apply for a visa to visit the United States. This in turn means Chile’s government will no longer require U.S. citizens traveling to the country to pay a $160 reciprocity fee upon arrival in the country. While Chile is among the most developed economies in South America and is even considered an expensive city by many South Americans, tourism pricing is relatively competitive and the new policy will extend that status. 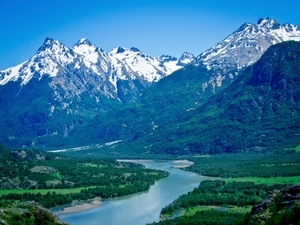 Tranquilty: Chile’s southern Patagonia region is a land of mountains, fjords, lakes and forests offering relatively isolated and inspiring landscapes far from the crowds. The resort town of Puerto Varas was dates back to colonization by German immigrants in the mid- to late 1880s. Their influence remains in the city’s numerous homes and public buildings finished in German period architectural styles. Perhaps even more impressive are the city’s natural attractions, highlighted by Lake Llanquihue, a massive fresh water lake surrounding the Osorno Volcano, site of a national park that features two species of wild deer, pumas and condors. Almost all of the species are endangered and protected.